The Stephens County Genealogy Library is staffed by Kristi King. Kristi holds a Bachelor's degree in American History and a Master's of Arts degree from the University of Colorado, Denver in Modern European History specializing in Russian history. She delights in helping people research their family and learning their ancestors' stories. Because of her academic career, she has the ability to fill in the stories of discovered ancestors with historical context to give you a sense of what life was like for your ancestor at that time in history. 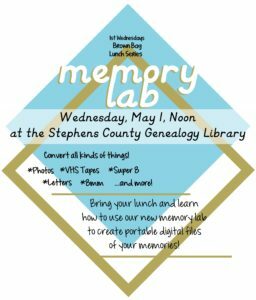 Learn how to use our new Memory Lab while you eat lunch!